South Korean artist Lee Changwon (born 1972) studied at the Kunstakademie Münster after graduating from Seoul National University's College of Fine Art, and was based in Germany for over ten years. Lee makes artworks incorporating visual tricks that question the nature of the act of seeing. 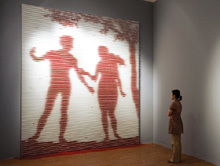 The works in his well-known human silhouette series appear from a distance as though they were paintings on canvas. 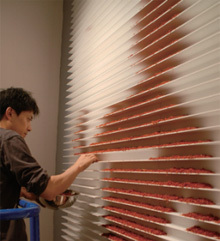 In reality, however, the images consist only of shadows cast by objects such as tea leaves and safflower petals that he arranges on white, venetian blind-like shelves affixed to walls. The exhibited work, Parallel World, uses photographs with elements cut out of them. 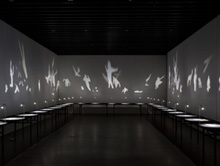 Light is directed onto these cut-out sections and reflected off mirrors underneath to produce dynamic silhouettes that are projected vividly onto the surrounding walls. However, many of the newspaper and magazine news photographs depict tragic scenes, and in some cases the silhouettes of people killed in strife-torn regions have been cut out. Although “Parallel World” has been exhibited previously as a series, this exhibition will present a new version including images from the recent news in Japan such as the Great East Japan earthquake, as well as other new sources. Upon realizing these images that stand out so clearly are formed from delicate materials likely to crumble the moment they are touched, and that behind the innocently fluttering silhouettes lurks tragedy, we begin to doubt what we see with our own eyes and appreciate the unreliability of our own consciousness. What are we really looking at, and how do we perceive the world? Through his skilful use of visual trickery, Lee seeks to expose the mechanism and dangers of the act of seeing. "Arab Express: The Latest Art from the Arab World" and Tokyo City View Observation Deck (excludes Sky Deck).